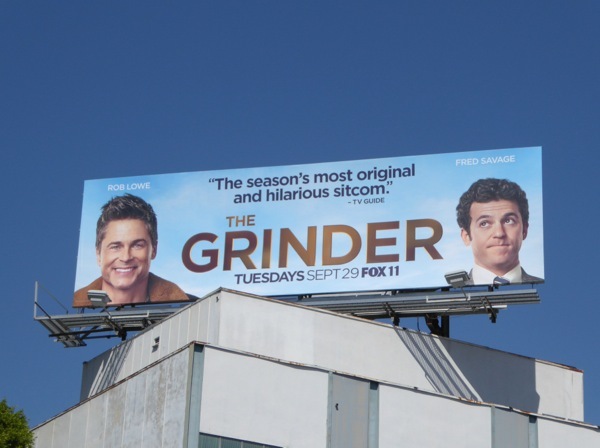 You may be forgiven for thinking that the new Fox series The Grinder is something to do with the gay hookup app Grindr, especially as the billboard-within-a-billboard creative promises 'There's no one he can't get off', but Rob Lowe's latest small screen outing is a different beast entirely. 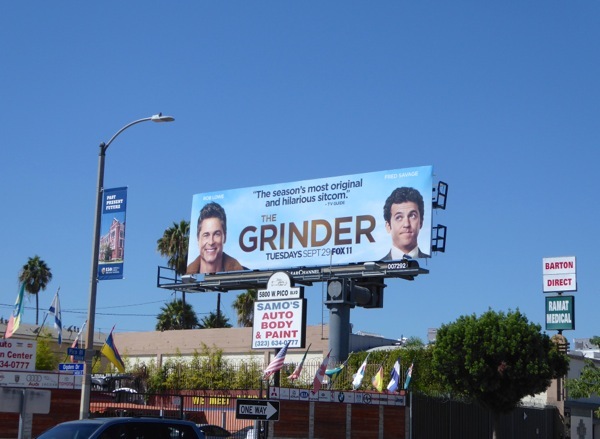 He joins Fred Savage (all grown up from The Wonder Years) as brothers, one who's a real lawyer and one who's played one on a TV show for eight seasons. 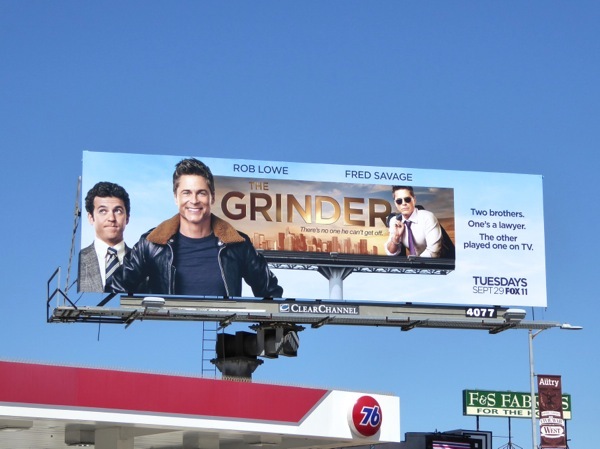 Just as his brother 'Stewart Sanderson' is about to take the reins of the family law firm, 'Dean' moves back from Hollywood to his hometown of Boise, Idaho, and thinks despite having no law degree, no license to practice and no real courtroom experience he has something offer the firm. 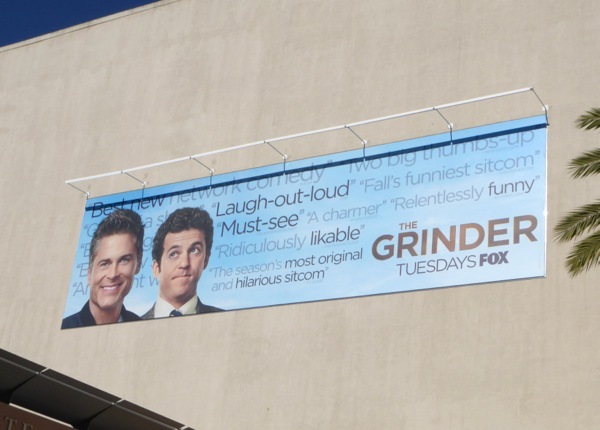 The fun will obviously be seeing how that dynamic works out. 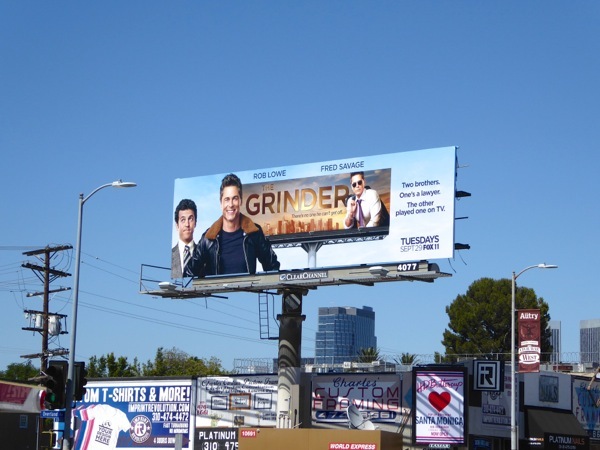 These series launch billboards for The Grinder were spotted along Pico Boulevard, the Sunset Strip and Beverly Boulevard from August 12 to August 24, 2015. 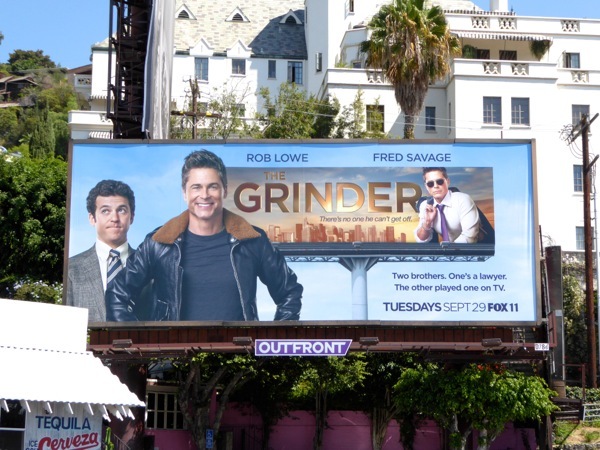 If you're a fan of Rob Lowe, be sure to also check him out in these billboards for Killing Kennedy and these billboards for Prosecuting Casey Anthony. 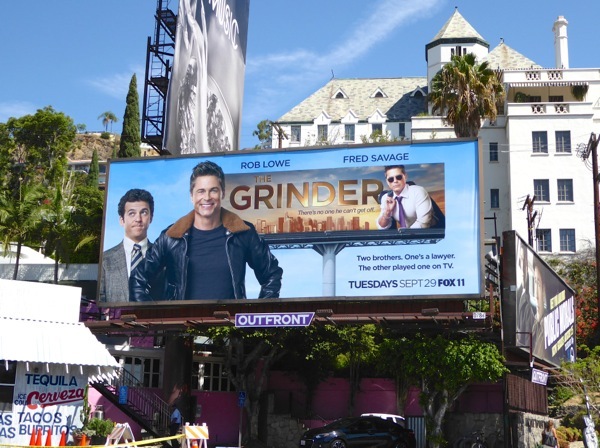 Stay tuned in the coming weeks for even more new Fall season TV show billboards, in the meantime, enjoy the rest of the weekend, as tomorrow it's back to the usual daily grind. 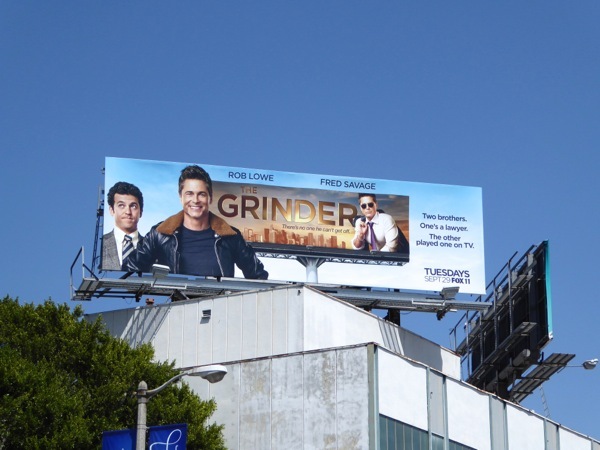 UPDATED: The Grinder seems to be going down well with critics and here's a new simplified billboard creative featuring the two stars and a favorable quote from TV Guide. 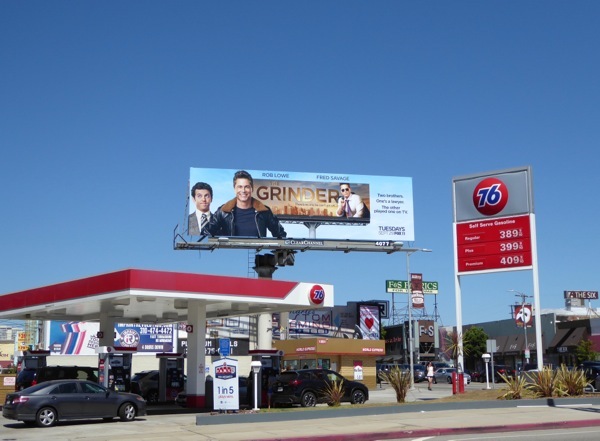 These new billboards for the freshman legal comedy were spied along Pico Boulevard and Beverly Boulevard on September 19, 2015. 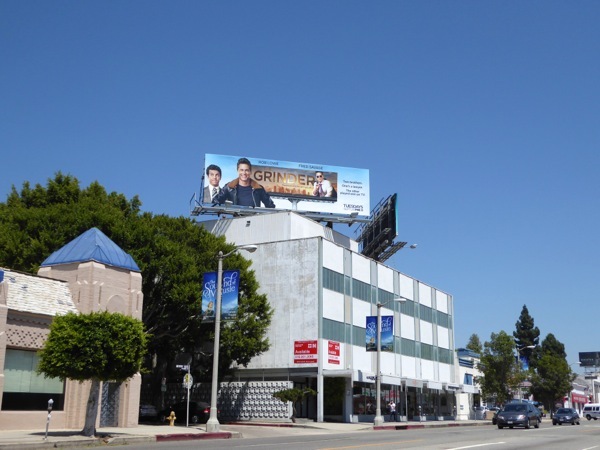 UPDATED: Here's another billboard plastered in reviews for the new comedy spotted at Fox Studios along Pico Boulevard on December 12, 2015.